Beautiful processional cross with traces of its gilding. France, circa 1750 Weathered. Measurement includes the wooden base. Unique hand forged iron village cross that once stood in the centre of a Provençal village. Wrought iron on a sandstone base, France, 18th century. Weathered, small losses. Unique hand forged iron weathervane representing a harlequin. Beautiful eyecatcher. France, circa 1750-1800. Weathered and losses. Measurement here below is inclusive the wooden base. Unique and truly beautiful weathered oak tabernacle front, France, circa 1750. Weathered, small losses and old repairs. This piece can stand on itself. Beautiful naive Madonna with child. Stunning patina. France 18th century. Weathered and small losses. 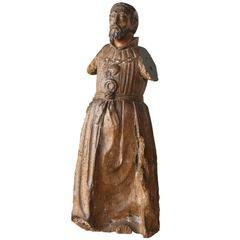 A wonderful 18th century Enclume - Anvil from the South of France. Wonderfully presented on its tree branch base. A terrific sculptural piece. 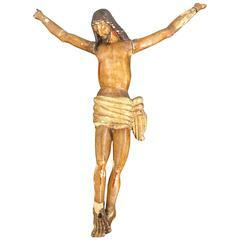 Carved wooden representing Christ on the cross. 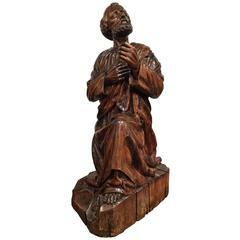 Carved figure of Franciscan abbot or saint, circa 1780-1800. 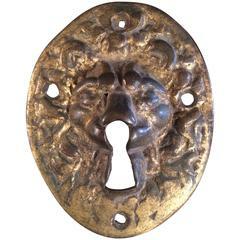 Interesting 18th century Italian gilt bronze escutcheon in the form of a lion.